By now we’ll assume you’ve read our comparison test of the 2016 Aprilia RSV4 RR and Kawasaki ZX-10R. If not, read it here (and shame on you for not reading it yet!) Both machines pack a wallop of performance for less than $17,000, and even though the ZX-10R didn’t come out the winner in our comparison test, it’s by no means a boring bike to ride. Kawasaki stepped up big time when updating the new 10R – which was a pretty good performer in its own right considering it won the 2015 World Superbike championship – and the 2016 model bests its predecessor in almost every category. Ultimately, sportbikes like the Ninja and Aprilia are born to rip around a racetrack as fast as possible. Boasting features like advanced traction control based around a five-asix IMU, a lighter, freer-flowing, and more powerful engine than before, and Brembo M50 calipers, here’s a visual demonstration of what the Kawasaki can do. 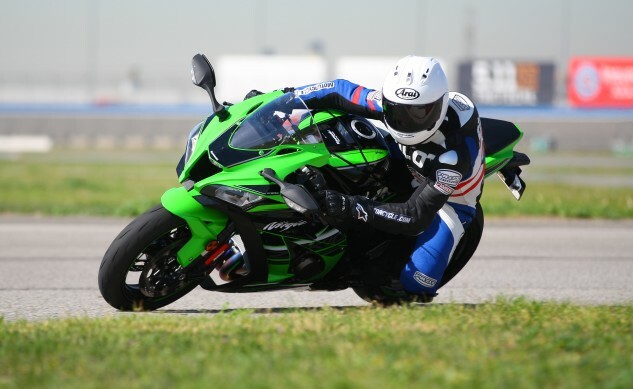 Come along for a lap of Auto Club Speedway aboard the 2016 Kawasaki ZX-10R.